The solar thermal market in Switzerland has been shrinking for the past years because of increasing competition from photovoltaics and heat pumps. Additionally, the low oil price has led to a wait-and-see attitude among potential customers. The market continues to show no signs of an upturn despite the introduction of a CO2 tax on fossil fuels around 10 years ago. This tax, however, has done little to compensate for the one-third reduction in oil prices in 2015 and 2016. A more suitable alternative would be a levy linked to oil and gas prices. Switzerland implemented a carbon tax on fossil fuels for heat supply in 2008. It was set at Swiss Franc (CHF) 12 per tonne of CO2, which was only 2.3 % of the then-average oil price for end consumers incl. VAT (see the table below). 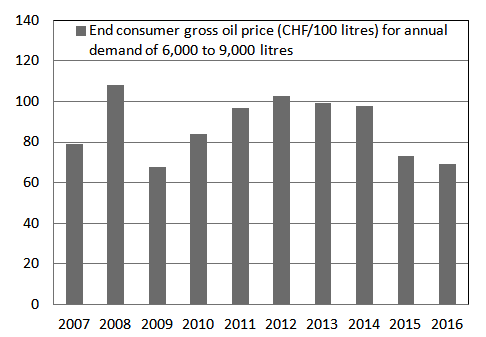 To achieve the expected reduction in fuel consumption, the government has increased the tax over the years and in 2018, it will be 8 times (96 CHF/t of CO2 = 82 EUR/t of CO2) what it was in 2008. Burning 1 litre of heating oil produces 2.65 kg of CO2. At a levy of CHF 96 per tonne of CO2, this leads to CHF 25 per 100 litres. The table shows that the tax raises the end consumer price by as much as 30 %, although it is still considerably below the most recent peak levels found between 2012 and 2014. No levy has been imposed on biomass – as it is considered a carbon-neutral technology – and motor fuels, such as petrol and diesel. Some companies, for example, in CO2- or energy-intensive markets, are exempt if they commit to reducing emissions or participate in the emissions trading scheme. To have a meaningful impact on the market, the tax needs to be much higher than it is now. The current maximum legal tax rate is CHF 120 per tonne of CO2, which translates into 3.18 centimes per kWh (see the table above). Stickelberger is convinced that this is not enough, as solar heat prices in Switzerland are fairly high, between 15 and 40 centimes per kWh. To achieve competitiveness with the most cost-effective applications a tax of 240 CHF per tonne of CO2 would be necessary, which is twice as much as the current maximum tax rate. Therefore the new CO2 law, which is discussed in Swiss parliament next year, should propose a new maximum CO2 tax level.